On March 6th, 2018, employees and citizens from all over Haywood County met with Health Department Educators and Coordinators to discuss their goals and the progress they have made. Their main goal: to improve the health and wellness of those in their workplace communities, and to produce measurable results of their success. 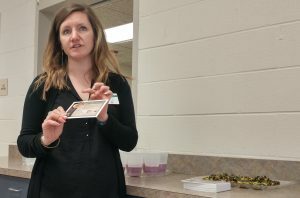 There were over a dozen people from Haywood County businesses and schools at the recent Haywood WorkWise Council meeting, which meets biannually at Waynesville Recreation Department. MountainWise Community Health Coordinator Nan Kramer is a primary organizing force behind the WorkWise Council. She reflected that: “with such an enthusiastic turnout, the meeting itself was a success.” This was evident in the number of people and also in the enthusiasm, ideas and stories of lives changed and lives saved. WHAT IS THE WORKWISE COUNCIL? 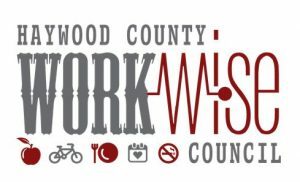 The WorkWise Council was created because employees spend approximately 36% or 1/3 of their waking hours at work. That is why statewide measures focus on bringing nutrition and exercise to people at their place of employment would be an effective way to increase health and quality of life for citizens, and also to reduce overall healthcare costs. That’s why Nan Kramer reached out to employees from a variety of settings, ranging from banks to schools to churches. Nan connected with motivated and passionate individuals to lead the wellness program at their locations, and works closely with them to provide information, inspiration, practical solutions and support. WHAT DO WORKSITE TEAM LEADERS DO? Team Leaders create programs that will engage fellow employees to participate in activities which increase health and wellness. Meeting attendees discussed successful activities such as cooking classes, chair yoga and even line dancing, noting that exercising can be fun and non-traditional. For those who prefer more traditional forms of exercise, team leaders worked with Nan to bring workout equipment to office spaces, and also to assist in creating the space for the equipment. HOW DO LEADERS ENCOURAGE MOTIVATION AT WORKSITES? “Keeping people motivated is the biggest challenge,” reflected Brittany Buchanan, HR Director from Waynesville. One way to get people motivated? The answer is something that motivates people to show up at work every day: Money! Individuals can earn money for participating in activities, and respond well to this incentive. Brittany elicits motivation through a point system “passport” at her worksite. Participants look at the “passport” chart and see that they can earn points for things like: physical exercise, getting routine exams, attending nutrition classes and purchasing a fitness device. In turn, they earn gift cards for up to 75 dollars. Having the paper passport is a concrete reminder and motivating factor for employees. That’s not the only way to get people involved. “Jealousy has created motivation,” Laura Tragessor said while discussing her program at Entegra Bank. The Branch Manager clarified, pointing out that it is important to highlight participant success stories within communities. For example, at her site participating bank employees can trade earned points for time off from work. When one employee earned enough points to take the day off, other employees saw it and said “Hmm, I want to earn a day off too!” This increased motivation. Laura also utilizes innovative approaches such as earning points for picking up litter outside. Picking up litter outside brings other elements to activities, elements of practicality and also community. Program Leader Anthony Price discussed the importance of community while promoting health and wellness, noting that some people are motivated by seeing a bigger purpose to the activity. That’s why he focuses on promoting activities that are “healthy for yourself and also helpful to community.” He is organizing a team for an upcoming 5K on May 11th in Clyde. His wellness team, called “The Lunatics” will begin the run at 8:45 PM and members can run or walk the entire 3.2 mile race. Whether they run or walk, it will be a fun community event, with proceeds going to a local church. THE PROOF IS IN THE HEALTHY PUDDING. Worksite wellness programs work and that is why they continue to thrive. They build a sense of community at work, increase health of individuals and save money. Brittany Buchannan noted that her company has “had a 0% increase in our health insurance for 3 years now.” That is one of the incredible benefits of incentive -driven employee participation in the wellness programs. Her company has been able to use program participation as leverage while negotiating with insurance companies. Saving money is excellent, but it’s the life saving that keeps leaders motivated. Nancy Warren highlighted a story of a woman named Donna Beaver, who went from a size 26 to a 16 while participating at ‘Haywood Vocational Opportunities’. The weight loss reflects the changes she made after forming new life-changing, healthier habits. Stay tuned for an in-depth story about Donnna Beaver! The Council is growing, and new members are welcome. Set one up at your place of employment and reap the benefits. Contact Nan Kramer at nan@mountainwise.org or 828.356.2202 for more information. Contact Nan Kramer or Anthony Price (aprice@haywoodministry.org) who can assist with bringing cheap equipment to your office. Mountainwise is the hub for the WorkWise Council, with Nan Kramer at the center of the hub. Contact her with information about events and information, which will go out in her newsletter. And remember, word of mouth is the most effective way to spread info about an event or about the program perks, so talk, talk, talk, while you walk, walk, walk.